Participants in the soils judging contest included (l-r) Brendan Wray, Kolby Rogers, Zach Little, Elisabeth Williams, Morgan Hissong, Colton Beatty, Mason Garber, Jacob Winterrowd and Walker Lindemuth. TROY – The Franklin Monroe MVCTC FFA chapter participated in its first contest of the year, district soil judging, on Sept. 27 in Troy. Nine members from Franklin Monroe MVCTC FFA chapter participated in the contest. Those members were Walker Lindemuth, Kolby Rogers, Jacob Winterrowd, Brendan Wray, Morgan Hissong, Elisabeth Williams, Mason Garber and Colton Beatty. Four of the members completed the rural soils judging contest, which is concentrated on examining the soil for agricultural production use. The other members took part in the urban contest. The main idea of the urban contest is analyzing the soil for constructing buildings with basements, sewage treatment facilities, roads and driveways. Soil judging has multiple stations and when assessing the soil there are many different properties to observe and record. “There are multiple soil pits and a testing station.” said Walker Lindemuth, who has participated in the contest for two years. Members who participated in the contest had to examine slope of the area, structure and texture of the soil, compaction, infiltration and also take a test made up of general knowledge questions and questions based on a soil survey. Participants in the contests also had to pick the best management practices for the area based on how the properties of the soil affect water quality, erosion and compaction. Some examples of best management practices are using cover crops for compaction or erosion issues. A management practice for the urban contest would be to reinforce concrete wall or add a porous material to deal with the effects of fine soils. 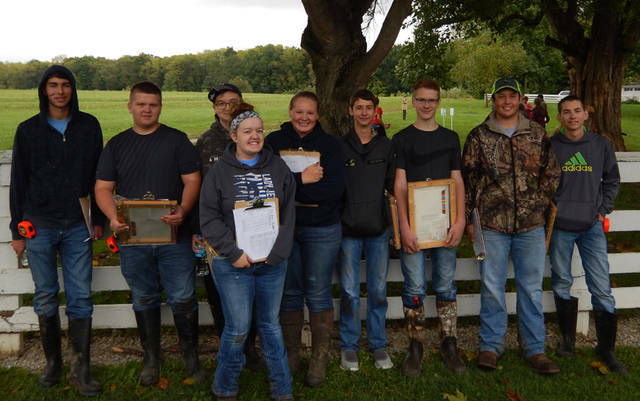 The participants in this contest not only spent time after school preparing for this contest, they also participated in the county soils judging contest that was sponsored by the Darke County Soil and Water Conservation District. This contest was held just north of Greenville in a field owned by a local producer. Working with the experts at this contest definitely helped to prepare the students for the district contest.